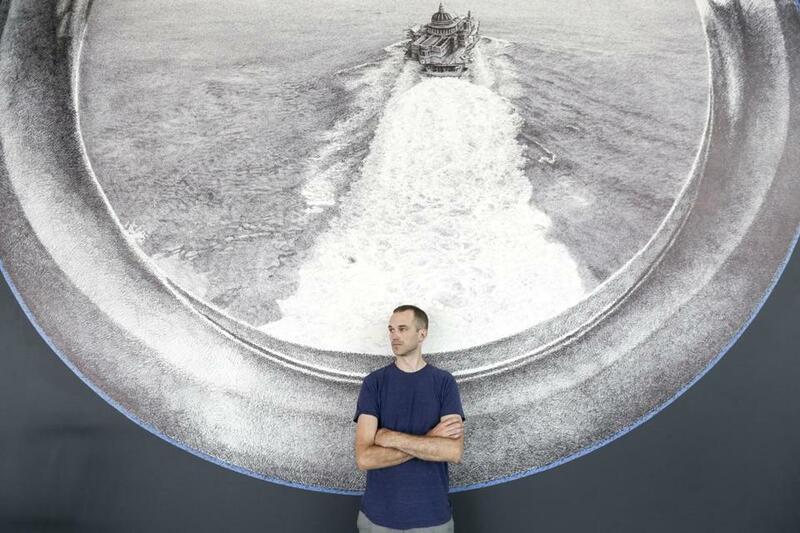 Ethan Murrow has spent the last two weeks scribbling on the wall at the Institute of Contemporary Art. On Monday afternoon, two of his three assistants stood close to the Sandra and Gerald Fineberg Art Wall, site of Murrow’s new mural, filling in gray areas with loose, easy zigzags of their Sharpies. 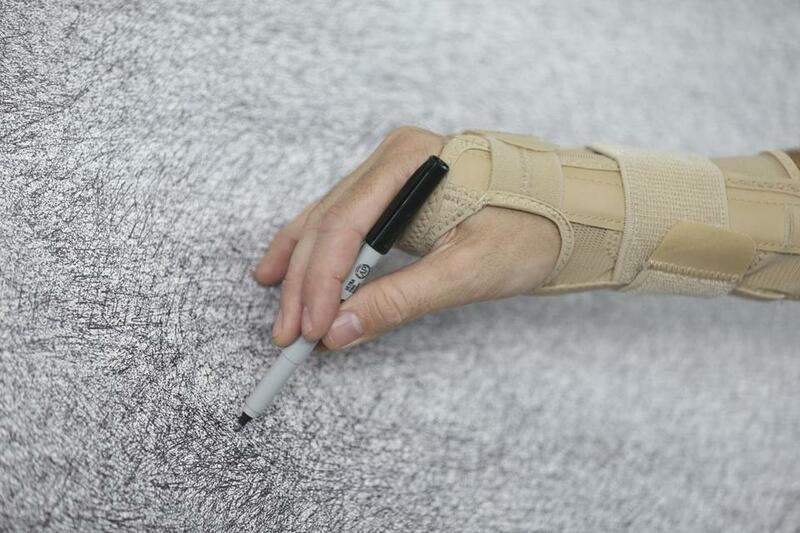 “It’s a controlled scribble, knowing where to end the gesture and where to open it up,” said Murrow. The exhibition officially opens Saturday, but ICA visitors have been watching his progress. Up close, you can’t miss the individual marks. From a distance, though, Murrow’s mural, “Seastead,” is so cleanly rendered, it might be a black-and-white photograph. Yet the image is absurd: London’s St. Paul’s Cathedral sits on the deck of an aircraft carrier in the midst of a vast ocean. Murrow frames it in a circle, as if you’re looking through a giant lens. A smaller drawing in an upper corner depicts a man on a ladder descending from the basket of a sagging hot air balloon. In his South End studio late last month, Murrow had only a mock-up he’d made on his computer, not much larger than a standard sheet of paper, to explain what he planned to do. The riddles of the images, put together from archival photos, were no less perplexing on a small scale. Murrow doesn’t have the answers. “Seastead” is another of his laden, obsessively made drawings referencing history, power, and potential failure. He has exhibited internationally and teaches at the School of the Museum of Fine Arts. Local viewers may remember his “Flotilla” wall drawing in the 2013 deCordova Biennial. Made with a ballpoint pen, it dived into maritime history and pursuit of power, and it spanned the deCordova Sculpture Park and Museum’s three-story stairwell. Ruth Erickson, assistant curator at the ICA, tapped Murrow for the project. Murrow addresses those uncertainties subliminally in “Seastead.” St. Paul’s Cathedral has witnessed tremendous change, and here it is afloat. The artist found a photo of it circa World War II, after the Blitz. He spends a great deal of time mining for old photos. The black-and-white images underlie his aesthetic and tie into his personal history. His grandfather was legendary broadcast journalist Edward R. Murrow. The artist never met his grandfather, who died before he was born, but he feels his sway. “I know the work is influenced by my growing up watching black-and-white television of him and his peers,” Murrow said. While the palette is the same, the message differs. “Seastead” dizzies the viewer, with an epic bird’s-eye view from the aircraft carrier’s wake to the distant horizon line. Ethan Murrow at work on his mural. On Monday, the cathedral and its carrier were complete, and Murrow and his helpers were fine-tuning the ocean. There was no grid on the wall to chart their picture. After initially mapping the drawing against a projection, Murrow was simply eyeballing his mock-up and filling in visual information. “The water is crazy, it really is,” Murrow said. “I do think it’s the hardest thing to draw.” There are countless shifts in tone, wave patterns to capture, and a gradual sharpening from the soft horizon line down to the crisper, foamy wake. Murrow may have been scratching his head over the angles of waves and the patterns of whitecaps, but a careful viewer wouldn’t suspect: Even unfinished, the rendering looked uncannily real. A more pleasant challenge came with integrating the mark-making styles of the four men with Sharpies. Although Murrow had claimed ownership of the cathedral and the boat, the ocean required all hands on deck.